I go on foot everywhere I can, looking around, and later, remembering. This way, the world goes by at a slower pace better suited to my eye and temperament. After a particularly noteworthy expedition, I abstract a recollected scene by exaggerating or suppressing visual qualities to reflect my feelings about it. I used to get frustrated that photos taken from the top of a mountain would seem so paltry when my memory of the view was so expansive. But experience and memory are shaped by influences outside the picture plane: feelings, thoughts, sounds, weather, or companions – that are alluded to by the voids and subtle visual discontinuities of these multi-panel pieces. 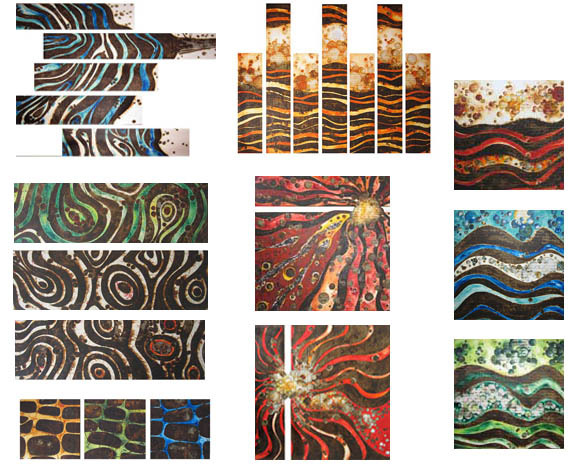 The paintings' patterns suggest the churning forces that shape earth and water and sky. It’s easy to become complacent, and, for me, roaming is the best remedy. I hope viewers find as much pleasure in the looking as I did in the trekking.